The correct position of the mitre is now evident, running from outer corner to inner corner of the hem allowance. All you need to do is add a seam allowance to this seam and you are good to go! Use the corner of the ironing board to your advantage, and to prevent the bulk of the jacket slipping off and stretching important parts like the neckline, plonk a weight on it – no more wishing you had an extra hand – or three! Another tailoring tip, this time for that junction between the collar and lapel. Leave a gap! Yes, don’t sew right to the junction, stop sewing about 1-2mm before it. This gap will be a blessing in disguise when you come to press, and will help prevent any nasty puckers at the collar/lapel junction. With your fingernail up against the edge of the foot, fabric is fed into the needle at a consistent width (and I can sew faster!) I use this trick a lot when topstitching at foot width, or sewing french seams on those slippery, shifty, jiggly, naughtily behaved fabrics. How you set in shoulder pads and/or sleeve head wadding can make or break the appearance of your tailored jacket or coat. In this tutorial there are a lot of tips to make sure you are doing it the right way. That’s my 5 Sewing Tips for this month – hopefully you found something new-to-you. Now it’s your turn – in the comments share your sewing tip of the month! Ooh I agree with your comment about learning to use your hands! Sounds so basic, but once you develop an instinctive feel for fabric manipulation it all becomes automatic. I haven’t heard of solvy – what exactly is it? Thank you! I think that the sleeve head/shoulder pads tutorial will be very helpful. Thanks Jen! There are a lot of useful tips there – hopefully something for everyone! Thanks Lyndle – I reckon that tip doubled my topstitching speed! 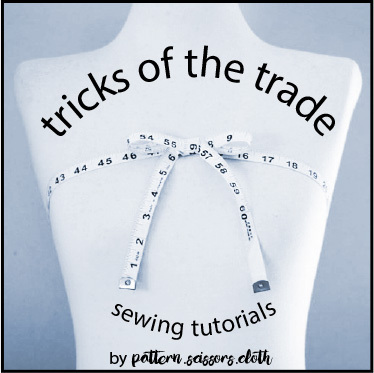 Very helpful tips, especially the sleeve head tutorial, which has arrived at an opportune time for my sewing endeavours. Thanks so much! Glad that it’s great timing for your project – how did you get on? Your monthly tips are very helpful and useful to get nicer finished garments. Thanks for sharing! Great tips! I’m trying to think of a good enough tip to share…. I hate hand sewing but I always always hand baste my zips in and often baste down facings before top stitching to stop things shifting and wriggling around….